Join Phil Koplin for his Artist Talk during the Funk Zone Art Walk at 4pm. He will be discussing the photographic project now hanging on the walls of his studio, Jews on the Beach. Open at random or by appointment, 1-5 pm. When I got off the F train at Coney Island on a sunny April day a few years ago, I wasn’t expecting to take many pictures, given the likelihood that no aspect of the amusement area near where I’d grown up had gone unphotographed. 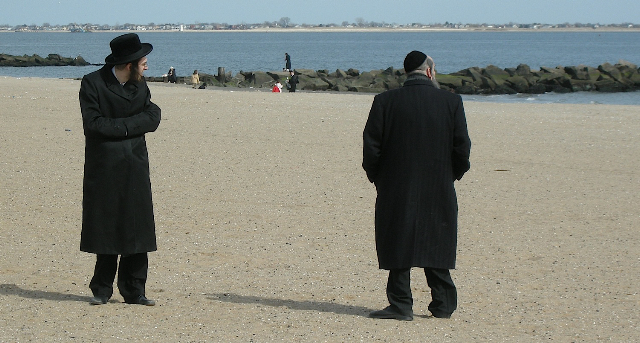 Instead, I encountered hundreds of Hasidic Jews on an outing to the beach, and I ended up taking more than a few photos. Most distinctive about the Hasidim to the casual eye is their mode of dress. Although the women adopt subdued and modesty-preserving styles, the clothing worn by the men might seem more appropriate to a fanciful costume drama about 18th-century Poland, reflecting not only strong attachment to tradition, but also intentional separation from the general culture. As the photos in this show attest, this holds even for a stroll on the beach on a sunny April day. ← Funk Zone Art Walk coming up June 14th!